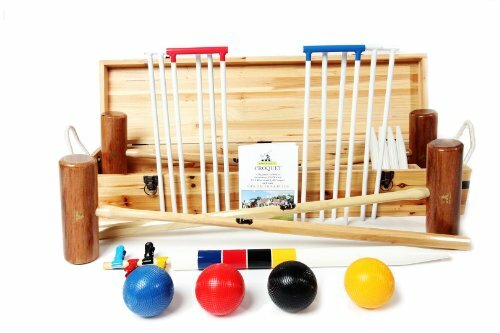 Your croquet experience will be enhanced when you play with the Wood Mallets 4-Player Garden Croquet Set. Whether you're a seasoned player or just a novice, this set contains all of the components needed for a competitive round of croquet, handcrafted from the finest materials sourced from around the world. Included in the 4-Player Garden Croquet Set are four 36" mallets made from hardwood to ensure an accurate and effective driving experience. The mallets feature octagonal handles and cyndrical heads which are hard wearing for garden croquet, yet robust enough to withstand serious play. Each mallet has a length of 36"and an average weight of 2 lbs 12oz. The Wood Mallets Garden Croquet Set comes with four composite balls made from moulded plastic with a lightly milled surface. This set has a lively rebound and is an ideal option for home garden croquet. The six powder coated wickets are made from ½" tubular steel with a solid 5/8th cross bar and have a smooth, hard-wearing finish. Center stakes are turned from hardwood and come in four colors; blue, red, black and yellow, each having a removable pin so that the peg can be knocked into the ground without being damaged. The handmade pine box is elegantly appointed with substantial break back hinges, steel latches, ornate metal corner plates and enforced rope carrying handles. Established in 1982, Wood Mallets Ltd is the largest manufacturer of croquet equipment in the Southern Hemisphere and the world's leading manufacturer of composite polo mallets. All Wood Mallets croquet sets are made from the best possible materials and carefully crafted to produce a high performance product. Finely crafted finger-jointed pine storage box with rope handles. If you have any questions about this product by Wood Mallets, contact us by completing and submitting the form below. If you are looking for a specif part number, please include it with your message.